A wacky fun cake stand that looks like a hat? It’s stripey and fuzzy, what the heck’s up with that? What do you think of first when you think of Dr. Seuss? For most people it’s the iconic red and white striped hat from “Cat in the Hat”. That hat, along with the story, is the inspiration for my DIY Dr. Seuss‐inspired cake stand. I paired the finished stand with printable red striped cupcake wrappers and toppers from my Stripes & Dots party collection to continue the theme. A tall terra‐cotta pot and large saucer are the building blocks of my cake stand. Why flower pots? They are sturdy and relatively inexpensive, and with a coupon or two I can make the whole thing for 10–15 bucks. I gave both pieces a few coats of white indoor/outdoor acrylic paint (Patio Paint from DecoArt), Once it was completely dry, I covered the parts of the tall pot that I wanted to stay white with painters’ tape, and gave the pot several coats of red paint. I also added a red circle to the center of the saucer top. Once the red paint was also dry, I removed the painters’ tape. Woohoo! Red and white Seuss‐y stripes! Fluffy blue trim (a‐la Thing 1 and Thing 2) was the finishing touch to my Seuss‐inspired cake stand, wrapped around the top of the saucer for a bit of whimsy. Just a couple dots of glue are fine, since this project can be easily repurposed throughout the year. 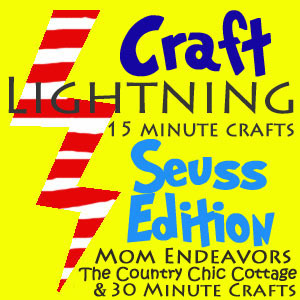 To see the rest of the Craft Lightning Seuss‐Inspired crafts, click the button below. Plus, check back in to see how this cake‐stand gets a Valentine’s Day makeover! Carla I love this soooo much!!! Fabulous job lady!! That’s brilliant! I’ll have to keep my eyes peeled for a pot that looks like that tall one. Where did you get that pot? I can’t find one anywhere. If i remember correctly, I found it at Hobby Lobby. Hope that helps! Hi I was wondering where you found the blue fuzzy trim around the pot?? or what’s it called?! thank you!! Hi Sarah, I’m pretty sure I found that trim at Hobby Lobby. Thank you! I’m hoping to recreate this for my twin’s first birthday. Wish me luck!